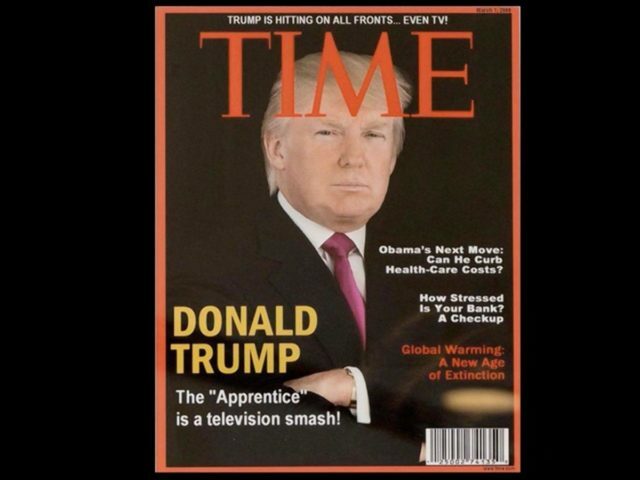 Fake Time Magazine cover that Donald Trump hung up. It was meant to look like it was published in 2009. Time called, they want their cover back. Donald Trump, who is as incapable of telling the truth as he is of running a country, has apparently made up yet another lie about Time magazine in what is now a running series of yuuuge Time-sensitive lies. Either Trump’s just really as dumb as we always feared, or he’s out to break a record for lying — in 280 characters or less. First off, the editors of Time couldn’t have called him to offer him “Man (Person) of the Year” because they have called the annual honor “Person of the Year” for 18 years. OK now, not to panic anybody, but this guy’s obsession with Time magazine is bordering on dangerous. It’s so severe it propels the leader of the free world to tell increasingly outrageous lies about it and him; lies that are as obviously false as his hairline. Read more at the NYDailyNews.com.